I have seen Adimai Penn several times but when I looked at this scene, it was something different. 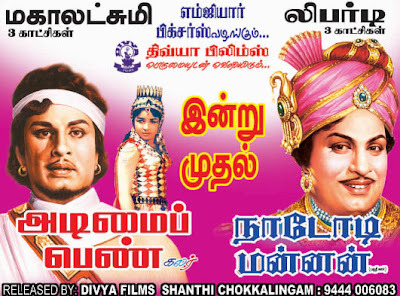 MGR is the Real Action Hero. I feel that no Indian Actor of his age will do this kind of stunt in any Indian Movie. The Ad for Adimai Penna and Nadodi Mannan from Daily Thanthi Chennai Edition. Forwarded by Yukesh Babu, MGR Devotee.